1). Roast rice in a pan with a tsp of ghee in medium flame till you get a nice aroma. Make sure the color doesn't change. Keep aside. 2). Grease a tsp of ghee in a pressure cooker and pour the milk along with the roasted rice. Pressure cook for 2 whistles and switch off ! 3). Once the pressure releases, mash the cooked rice with a ladle. Add sugar along with a pinch of salt and stir well. Simmer for another 10 minutes or till it reaches desired thick consistency and switch off ! Garnish with saffron and serve warm or chill. # When payasam cools down, it thickens. So, accordingly adjust the consistency when switching off. If it thickenes more you can add warm milk and adjust the consistency. 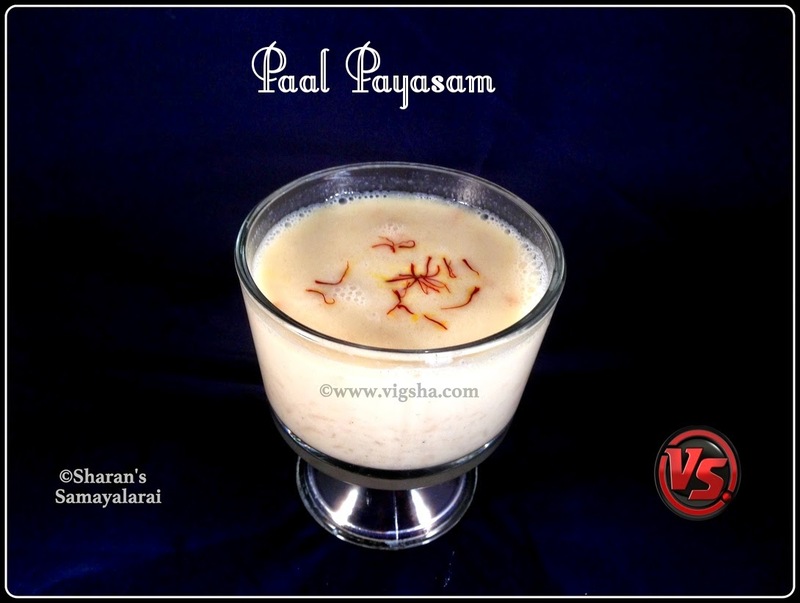 # I like this payasam to be plain, but you can very well add chopped nuts. # You can also use cardamom instead of saffron.